"One of the best books of this genre to cross my desk in some time; its easy style will be of equal appeal to experienced readers and newcomers to spiritual matters alike." - Psychic News. 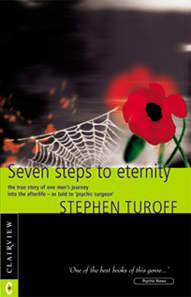 "I died in the Battle of the Somme..." These were the astonishing first words spoken to clairvoyant and healer Stephen Turoff by the soul of James Legett, a young soldier who was killed in the First World War. For two years, the world famous psychic surgeon communicated with the soldier's soul, and in the process wrote down his remarkable story; not the tale of Legett's tragically short life on the physical plane, but of his death on a battlefield in France and his soul's subsequent journey into the afterlife. Although he works with many discarnate spirits in his clinic, the dyslexic Turoff was initially reluctant to undertake the task of writing a book. But he was persuaded by the boisterous and genial soul of the dead man. Their literary collaboration involved an unusual method: Legett presented spiritual pictures to Turoff, who with clairvoyant perception interpreted them into words. The result is this enlightening testimony of life beyond the illusion of death, filled with insight, spiritual wisdom and delightful humour. It is written to show that we are all eternal; there is no death... only change.